OK, that may not have happened exactly! But the principle’s pretty obvious … Social media is potentially dangerous – even destabilising – to the established order. It has to be discredited … and that’s exactly what’s happening. So, we know we’re right somewhere. Why exactly is it happening? Who, or what, is doing it? And how did we know that it had to happen? By ‘the system’, of course, we basically mean capitalism: a system that allows a small elite to live in privilege while keeping the rest of us fighting among ourselves for what’s left. Capitalism has two essential weapons: an unequal distribution of wealth and power, and disinformation. Social media threatens the former in a small way but the latter massively. So why is capitalism so stable? We can’t deny that it is. It doesn’t make sense; it’s unfair – in fact it’s downright evil; it’s destroying the planet; it enforces miserable lives on the vast majority of people that survive it; and many millions routinely don’t survive it; almost all of us would be better off without it. But it’s still here; we do nothing about it; it’s survived revolutions and local, temporal and spiritual denouncement; it will probably still be in place when it’s finally caused the world to burn around us and we’re all blaming each other – even though it was responsible. How does it do that? Well, to get a single, simple answer depends entirely on your underlying philosophy. (But perhaps there is no such single, simple answer: perhaps the real answer is much more complicated … or perhaps all the individual answers are right in their own way.) Perhaps we should instead start with something along the lines of: Is capitalism natural or unnatural? … and see where that takes us. Essentially, do you think capitalism is an abomination, artificially maintained by a small number of evil people; or do you think it’s an unfortunate, but unavoidable law of the universe that societies have to decay into it? To what extent, is there ‘a little bit of capitalism in all of us’, perhaps? 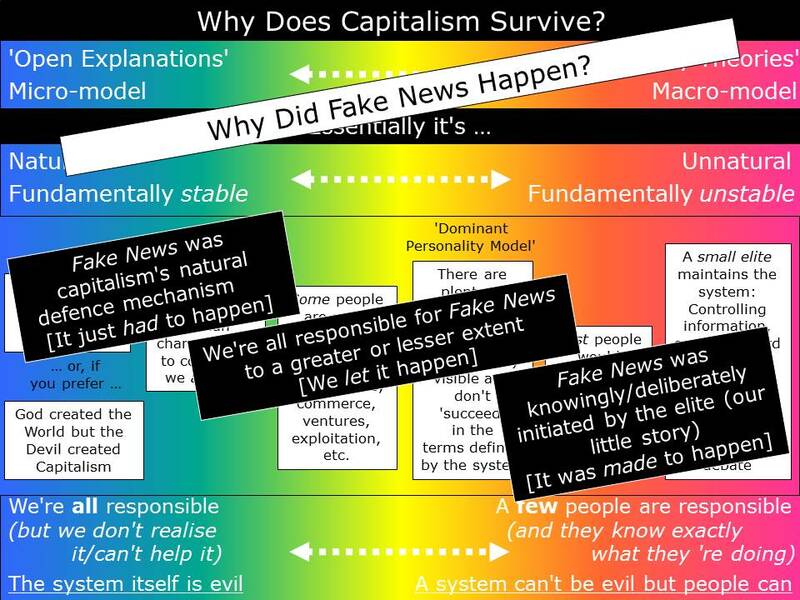 Now, whichever underlying philosophy we like – whichever part of the diagram we think best explains the truth, we can translate the fake news phenomenon accordingly: we can plonk down an appropriate version in the right place, in the right terms. … and you can add whatever subtle variants you like, wherever you prefer to relate back to the original model: it makes no real difference. 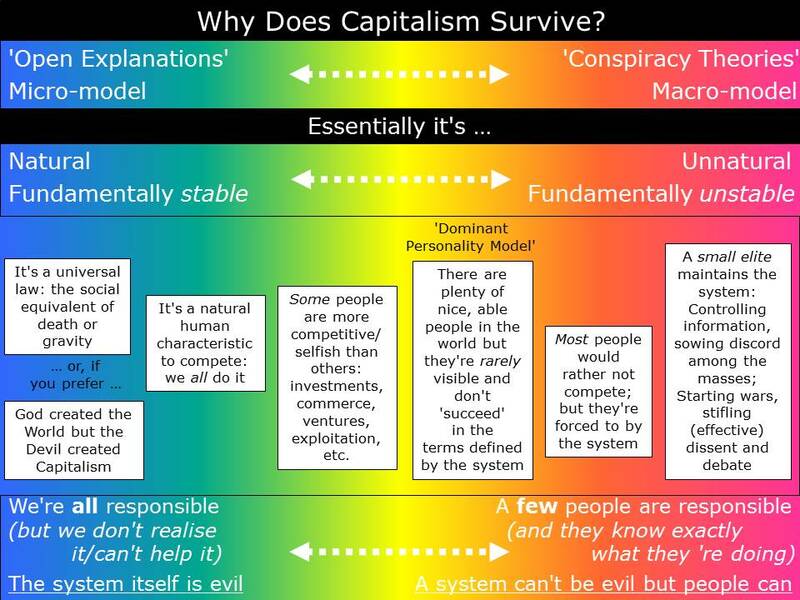 Over time, capitalism has evolved; not in terms of its underlying evil (whether that evil be fine- or coarse-grained as in the diagram) but in terms of its raw materials. Capitalism works by processing raw materials into something else for profit, somewhat brilliantly profiting ultimately from the same people it exploited to make the something to sell to them in the first place. (Always profit, of course: capitalism creates leisure facilities and shopping malls joyfully but hospitals and schools reluctantly – and only as a necessary part of whatever stabilisation mechanism it uses.) The raw materials have changed over time from wood and stone, to metal and plastic, and now to data; but the principle remains the same. It stays utterly stable – we just can’t agree on why, which is why it’s even harder to agree on questions derived from it. So, did Fake News have to happen? … Yes of course; social media couldn’t be allowed to be a force for good: it had to be corrupted like every other nice thing that we could have but capitalism won’t let us. Why? … Who knows? Who cares? It was just inevitable: just like everything else. Social media had to be wrecked: it was just a small victim of whatever (law or otherwise) keeps capitalism intact. Capitalism will survive – right to the bitterest of bitter ends. It will destroy us. And we’ll still be blaming just about everything and everyone else as it does so. This entry was posted on Monday, April 3rd, 2017 at 7:45 am	and tagged with Capitalism, Fake news, Media bias, Political stability, Social Media, Technocapitalism and posted in Computing, Philosophy, Politics. You can follow any responses to this entry through the RSS 2.0 feed. « Good Robot? Bad Robot?